I love being entertained, there’s no doubt about it.Â I watch television or a movie nearly every day and I have an X-Box 360 and love playing my favorite games.Â Bioshock anyone?Â But I also read, I go biking and I hang out with my friends.Â Yet something does not have to be entertaining for me to enjoy it or to keep doing it.Â Sometimes what I’m doing is nothing short of pure suffering, but I’ll keep doing it because I have to.Â If we become slaves to entertainment than we are some of the worst people around.Â Maybe not kill thirty civilians when we shell a clearly marked UN school in Gaza kind of bad, but bad nonetheless.Â Now there is a movie which examines this idea much deeper out in a brand new format. Starting this December 30th, now available on Blu-ray from Paramount Studios Home Entertainment comes the story about the distance people will go for entertainment, the cost paid by those captured inside and the human desire for reality.Â Â The Truman Show â€“ Blu-ray Disc is ready to draw you inside of your television screen and ask you what entertainment is really all about and the worth of the lives of those being exploited.Â Bring home this fantastic film in a great new format today. Truman Burbank lives the perfect life.Â His family is perfect, his job is perfect and he has the best friends he could ever imagine.Â The only problem is that it’s all part of the largest and most successful television show of all time.Â Truman’s life is broadcast around the world every minute of every day as he lives inside of a giant dome where everything is perfectly controlled.Â Yet Truman knows something is missing and so he sets on a quest that could burn all of his bridges as he goes out to find his way to a real life.Â But will he choose safety over reality?Â This film stars Jim Carrey, Ed Harris, Laura Linney, Noah Emmerich, Holland Taylor and Peter Krause. The special features included in this Blu-ray presentation are both the first and second parts of the featurette about the making of this groundbreaking film, a deeper look into the visual effects used in the movie, four deleted scenes, a photo gallery, two television ads for the film and two original theatrical trailers in high definition. I have always thought that this was an absolutely fantastic film and the new special features and high definition only make it that much better.Â What lengths are people willing to take their entertainment to simply to ensure that their minds are a little distracted?Â What type of code should there be?Â Some of these issues were dealt with in the Travolta film, Mad City, but this film gets more to the core of the issue.Â The last line of the film between the two security guards is incredibly telling.Â Kurt Vonnegut wrote a story that referenced something along these lines.Â After the Bergeron family sees Harrison Bergeron assassinated by Diana Moon Glampers, they forget quickly because they’re so focused on being entertained.Â Entertainment can turn us all into monsters. This film will Show you what entertainment is really all about. 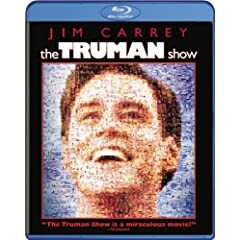 No user commented in " Movie Review â€“ The Truman Show â€“ Blu-ray Disc "